【High-Quality HEPA Filter】This white air purifier can absorb 99.97% articles including dust, smoke, odors, mold spores, and bacteria. Works great with particles as small as 0.3 microns and larger, while filters air pollution of PM 2.5 to help improve overall health. 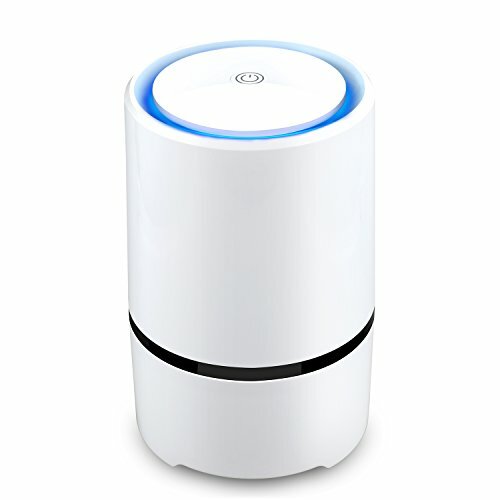 【Good Life Companion】The air cleaner generates negative ions, dubbed as "vitamins in the air" in the medical field to kill bacteria and absorb unwanted particles, which helps to soothes the nervous system, prevent neurosism and improve your immune function. 【Easy to Use】One-touch switch; Just press the On/Off button on the top once to turn on the unit with warm blue LED light on, and press it again to enter into sleep mode to dim the light, it will power off 8 hours later automatically. 【Ideal Gift】Ideal for pet owners, babies, children, elderly, or anyone suffer from allergies, nasal stuffiness, cough, sneezing, asthma, etc and need to improve air quality. Perfect gift for father, mother, office mates and friends.